In today’s episode I sit down and talk to two long-time business partners, great friends and excellent marketers. Claudia and Tom Trusty are the co-owners of Trusty & Company, a full-service marketing partner that maintains a diverse clientele ranging from brick and mortar retail to healthcare providers to a popular online knitter (and, of course, they only work with the best professional speakers). Whether you’re starting a business and need a brand new marketing strategy or just need a new website, Trusty & Company always starts with the same set of questions: tell us about you, your business, and your customers. They also ask new clients to tell them about what problem the client is trying to solve, and they address any preconceived notions they may have about marketing or design. Using improvisational techniques like Yes, And they can coordinate a marketing plan that improves on their client’s vision. In my time working with Claudia and Tom, they have helped me develop great products and improve the marketing for my business. The stellar design on www.PeterMargaritis.com gets a lot of great feedback, and the Search Engine Optimization (SEO) is excellent. My web page is the first search result on Google when you search for me (with some help from a name that’s pronounced like a cocktail and spelled like an inflammation). Google goes through about 500 algorithm changes every year, so Tom makes sure to stay up-to-date, but the most important thing for good SEO is solid web design. Another key aspect of Google’s algorithm is responsive design, or mobile-friendly design, which will greatly affect your search results. Design is a key element of online marketing, even if the content you are marketing is relatively dry. An accountant’s newsletter, for example, may contain very important information, but if it doesn’t look good who will open it and click through to your content? Trusty & Company help communicate information in a way that is both easy to understand and easy on the eyes. You can see a great example of their design in my newsletter. I greatly appreciate Claudia and Tom taking time out of their busy day to talk to me about marketing, design and SEO. I admire the way they use improvisational skills to collaborate with each other and with their clients, and I love the content that they create. If you’re anywhere in the world and you are looking to improve your marketing, design or communication strategies – for web or physical products – get in touch with Trusty & Company. Peter: Hey welcome everybody. I’m here today with Tom and Claudia Trusty of Trusty & Company, and first and foremost thank you both for taking time out of your hectic, busy schedule to spend some time with me on my podcast today. Claudia: Well you’re very welcome Pete. We are so excited to be here with you, and we’re never too busy for you. Tom: Thanks Pete. Appreciate the opportunity. Peter: And they are a marketing company. So why don’t you guys tell my audience what you guys do. A little bit about your background, a little bit about Trusty & Company. Claudia: What we do is we work with small and midsize businesses to help them bring their stories to their audience, and marketing is really about communication and so we use whatever tools and resources that we can develop that help our clients connect with their audience. Peter: It’s just that simple. Claudia: It is that simple. It really is. Peter: So Claudia, what’s your role in the company? Claudia: I’m the “& company” part. Claudia: I do most of our business development, working with clients. Client services has to do a lot of writing, but we collaborate on so much of each project that there’s an intense amount of overlapping. Tom: I take the trash, clean the dishes, I do the design and web design, print design, a little bit of interactive work, a little bit of IT – even though we’re not IT company we have to help our customers solve those problems sometimes. That’s pretty much it, really. Peter: He’s the artist behind the Van Gogh. Peter: He’s the artist behind the Picasso, and we have gone, over the years that we’ve been doing business, we just launched a few months ago – I can’t remember what version. Claudia: Fourth or fifth, maybe. Peter: Fourth or fifth version of the website, and if you if you go out to my website www.PeterMargaritis.com, the feedback that I’ve gotten from those who have seen other websites, I can sum it up in one word: Wow. Peter: And that’s just not because we’re sitting across the table from each other. I was just in Nashville this week and my contact there went, “I love your website, why did you change?” And we’ll talk about why I changed that website, but you guys really took something that everybody liked anyhow – there’s never been one person to go, “who did that?” No, there’s always been positive comments and there’s always people coming up to me saying, “Who did your site, can give me the contact information,” and say, sure for a small twenty-dollar bill I’ll be happy to give you the information, but this this one really kind of blew everybody away. So I wanted to kind of start the conversation, since a lot of the audience may be entrepreneurs – I know I have a lot of speaker friends out there who are always trying to find that next edge, and if you don’t have a website anymore you don’t exist, or how can people find you, and so when we looked at redoing my website what were some of the things that you guys thought that we needed to address? 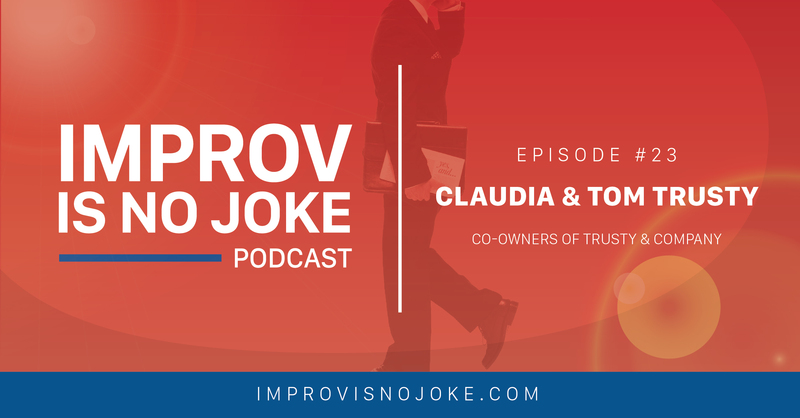 Claudia: Well what we really wanted to do is find out what you thought you needed to address and what you thought would help you better connect with your potential clients, and so those ideas we take back and – and to be honest what I do is go to Tom and say, you know what we need to do? And I come up with this pie-in-the-sky kind of concept, and then he figures out how to make it work: making it easy to understand, visually attractive, making sure we hit all of the key selling points for your business are really critical. Claudia: And then developing the behind-the-scenes infrastructure to accomplish that is really Tom’s job. Peter: Because I know what I came to you guys and I said I got some feedback, I want to change the website and make it something along the lines of less words, more pictures, more interaction. What’s the average time spent on a web page? When somebody surfing and they come to my page and they have never been there before? Tom: It varies, but it could be seconds – it could be not at all if the page doesn’t load properly. Peter: Even just from that back of the house piece: if it doesn’t load. Tom: Yes, but if I remember correctly your previous site was considered a little bit too corporate. Tom: It was a good-looking site, it did its job very well, except it was more focused towards the corporate audience, where you needed to change it to freshen up, lighten it up, make a little little more friendly to non-corporate audiences. Peter: To non-corporate, to meeting planners, to those who are out there looking to book me for speaking engagement. Peter: Yeah that was that was from the National Speakers Association group of people that I had around me, that was some of the feedback they gave. Lose some of the words, make it more dynamic, but I even find myself, if I go to a web page and I start looking at it – and it might be just because of the focus issue and ADHD, but if I see too much content there I might not even continue to search on or even look. Claudia: There has been an evolution in website development over the last – clearly over the last five years, and some of the technology that’s available now for us to use was not available just a few years ago. So graphics can become more predominant. The philosophy on content changes back and forth based on the type of business, but there’s a point at which you can have too few words because you’re not getting credit for what you’re saying, and then there’s the opposite: this is way too many words. Unless it’s like an academic, nobody’s going to read all this. Peter: Exactly. I’ll share an interesting story with the audience. I was attending a university conference earlier this year, in February, and there’s about 70 speakers attending this conference and the speaker was talking about websites and acronyms like SEO and things along those lines, and I’m still trying to wrap my mind around some of the analytics behind the website, and out of the room he made a comment, how many of you ever Google their name? He started with, who has their website with their name as the domain? And some hands went up, maybe half of the room maybe a little bit more went up. Then he says, has anybody ever Googled their name? And I mean I was surprised a lot of people hadn’t, and at that point everybody started Googling their name, and they said how many in this room, when you Google your name your name, it is the first thing you see on Google? And a very small percentage of us, maybe 6-7 hands went up, and then he said, how many when you Google your name, you take up the whole page? And there were only two of us in the room with our hands up, and I was one of them, and I started to think, why? And then it dawned on me I knew why, I just didn’t know why. Peter: I knew why, it’s because of you guys, I just didn’t know why, and that’s not something that just happens overnight. Claudia: No, it generally takes months and months to achieve those kinds of goals. Even sometimes it doesn’t happen, especially if you have a very common name. If your name is Joe Smith it’s going to be really hard like to fill up the page with you and that Joe Smith. Claudia: [laughs] –a little bit easier. Joe: No recipes up there, huh? Peter: No, no recipes up there. So what was it behind the scenes that you guys did over the years that we’ve been doing business together that I was one of a few of a group of speakers who I thought to all over the page. Peter: For quite some time, right. Tom: Even though it went through different phases, it was still there. Claudia: –and learn what they like and what they don’t like, and what they like can change. Generally about 500 algorithm changes a year. So they may like something today, but down the road they’re gonna hate it. Peter: So 500 different algorithms a year. They could like something in the morning and change it in the afternoon? Claudia: They could. Generally they’re not enormous changes, but they do change them with a degree of frequency, so Tom is really great at keeping up to date with what Google demands because Google owns search engine optimization and search engine searches. Claudia: So it’s best to do what they want. Peter: So search engine optimization. Is it like keywords that are put in the coding of the website and other things that we do? Tom: To a certain extent, yes, but it’s also just a solidly built website. Code that’s not sloppy, code that’s sufficient in all of these little, subtle things will give you a higher rating. Claudia: Yeah, and and because all these other technologies are coming to surface. Claudia: So a site isn’t built just on words anymore, and so we still follow those best practices because they’re important. The most critical thing is to build a site that looks and communicates very well to the customer. Claudia: If customers understand it and can read it, the robots and the search engine can find it and read it. Claudia: If you keyword “stuff,” which is called black hat SEO, and try to play some games, Google’s going to catch you and they’re gonna shut you down, and we didn’t have that happen to a client who – we didn’t do it – hired somebody else to take this gorgeous site that we had built him, and to do a bunch of behind-the-scenes manipulation, and Google shut him down. Peter: When you said shut them down does that when you search for them they just wouldn’t come up? Claudia: That’s right, and his business is driven off of people being able to search and find him. Claudia: So and that’s another reason why – I remember when we did this this newest design for you we talked about responsive web design, because Google came right out last year and said if your website is not responsive, meaning if it does not resize perfectly for any size device, from a mobile phone to a desktop, we’re going to start punishing you in mobile search. Tom: Think of responsive and just replace that with mobile-friendly. Your website needs to be friendly for mobile device. Peter: Right, and I do remember we were talking about this and you said that one of the most important things that we need to do is it must be it must be able to be read on a desktop, an iPad and on an iPhone, and I never really thought about that until you guys had mentioned it and we were doing the site, and then I was playing around with it. Tom: Five years ago, seven, eight years ago, nobody was thinking about it. The birth of the iPhone and smartphones changed the situation overnight. Peter: And then now, because I’m so aware of it, I go to websites now on my phone and I can’t read them or they say it cannot be read on this device, so when it says, it can not be run on this device, Google’s giving them a demerit. Claudia: Basically, yeah. I mean they don’t explain to you how they’re doing that, but for instance if you are going to search restaurants in Dublin, Ohio, and you have 10 of them that have mobile friendly websites and 10 that do not, the ten that do not go to the bottom of the list. Claudia: That’s what Google said they were going to phase in. Now who knows when they’re going to take that even further to say, okay, if you’re on an iPad, or if you’re on any other device, if you’re not fully responsive or fully friendly, we’re going to start putting you down, and most businesses don’t want to take that risk. Peter: So when you say putting them down, so they’re on page two, three or four. and you guys know this better than I do: what’s the likelihood of someone Googling something and they go to page two or three or four? Claudia: Maybe then, or people like us that do it just to see what’s going on. [laughs] Before we meet with a client we always want to see where they are. I can’t think of anybody that would bother. Tom: The bottom line is if you’re not on page one, you’re nowhere. Peter: Yeah, you’re already pretty much just lost out in the interwebs or something, whatever they call that thing. Claudia: No, Pete, that’s not what I say. Peter: And did you notice that, as she said that, I kind of cut what she said and what I heard, but she also said two magic words there. Peter: You’re getting moved to the top of my search engine. Peter: and they were talking about he’s in a movie that was written by Mike Birbiglia, a huge headliner stand-up comic based off of improv, and then Colbert’s a graduate of Second City, and they get into this whole thing of why improv is just the opposite of Hollywood, of show business, and it’s a great five-minute clip to watch. Claudia: I’ll have to go find that. Claudia: Does that make me the witch in front of the curtain? Claudia: Oh, okay. Thank you. Peter: That was pure improv there. Peter: Yes, And get the rolodex going – what was a good witch’s name, what was the good witch’s name? Peter: Glenda, Glenda the Good Witch! Yes, And, yeah. I think I just went blank over that… but the collaboration between you two, I would say knowing you two: Tom – analytical, kind of logical and building the design and stuff – and Claudia is very outgoing, gregarious. How does that work with the collaboration, because you guys have two different views, I would say. I know you’ve worked together for a while, but you come at things from different approaches. Tom & Claudia: Our strengths. Peter: We don’t have any cocktails either. Tom: No. I mean happy hour somewhere. Tom: It’s not just us collaborating, we collaborate with the clients, as you very well know. Tom: So it’s a three-way collaboration or, you know, however many people are involved. Peter: And you’ve never said, “What the hell, Pete?” You may have thought it. Tom: We can’t say that for every customer. Peter: Yeah, I’d say hope I’m a little more family than a customer. Peter: Because we go back many, many years, but as you’re talking about this collaboration it makes me think, from the creative aspect, do you not shoot down each other’s’ ideas? Claudia: No, we can’t do that. 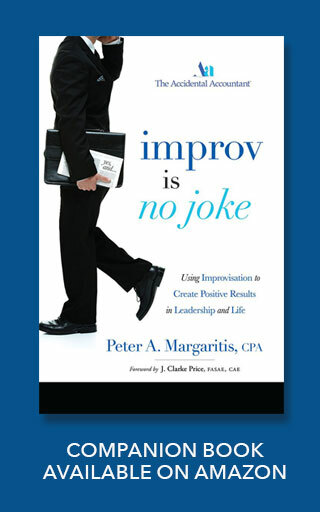 Peter: But so many times in corporate America we do shoot down somebody else’s idea, and something that I’ve learned through Second City, through improv, especially as it relates to creativity and Yes, And, is that bad ideas are bridges to good ideas. No ideas absolutely lead to nothing. And the different styles that you guys have when you come say maybe something completely out of the box, something preposterous, it’s just like, let’s play with it, let’s see what we can make of that, and I would have to believe your clientele respects that of your company. Claudia: I hope so. I think so. Tom: I think they notice it. I think they see us that way. Claudia: Sometimes clients come to us, especially in the first meeting or two, with preconceived notions, so it is that thinking inside the box, totally, that says, here’s what I need. Claudia: And they want us to tell them that I will give you what you need, but really where we want to start is, tell us about you, your business, and your customers. Tell us about what problem you’re trying to solve. Tell us why you believe you need a brochure or a sign or a website, and how you would use those things. So we really try to make them think differently about their situation, and sometimes it’s really good. Sometimes we start down a path where we come in to new ideas that they hadn’t thought about before, and sometimes it doesn’t work as easily because they’re not ready to yet. Claudia: But it is that Yes, And, let’s pursue the conversation. There’s no one size fits all for marketing, just like there isn’t for anything else. Peter: Right. As you’re describing that I’m thinking, so you’re sitting there and doing improv. You’re listening to customer. You’re probing or asking them questions before you decide where you think that they might go, even though they’re coming with this preconceived notion – can you build me a website? Peter: And tell me more about why you need a website, tell me more about what your business does. Peter: And I would think questions like, is the website for informational purposes, or are you thinking about e-commerce and going down that path, and whatever. Just out of curiosity, how long has Trysty & Company been around? I don’t remember. Tom: It’ll be 30 years next year. Peter: [laughs] And can you give the audience a variety of the type of industry, the type of clients, that you guys have in your portfolio? Claudia: We actually enjoy having a very diverse group of clients. We have some retail – both online e-commerce retail and brick and mortar. Most of our retail customers have both. Claudia: Although we do have one woman who sells knitting patterns, and she also has videos and she does things called knit alongs, and she has over probably about 150,000 hits on her youtube videos now. Claudia: Yeah, yeah. She’s really good at what she does. Claudia: So we have those customers. We also have some professional services like attorneys, speakers – well we only have the best speakers. Claudia: [laughs] We have healthcare providers that we work with. We’re very diverse. Peter: So dentists, orthodontists… restaurants? Peter: And you do more than just design websites and that type of stuff. Claudia: We’re really a full-service firm. So if you are beginning a business and you need everything from logo development to strategy – we love doing strategy development too – then we are perfect for you because we can do it all. Tom is really good at designing anything. Claudia: We’ve done packaging, we’ve done logos, billboards – which I don’t like because I think it’s graffiti, but we do ‘em. I tried to talk to more people out of them then we have done. Peter: Out of a billboard. Claudia: Yeah. I don’t find the value. Peter: Are they still there? Peter: Really? I just don’t see them. Claudia: See, they’re everywhere but you don’t see them. Peter: Or you see them, but you just don’t see them. Claudia: At 65 or 70 miles an hour it is virtually impossible for them to make any impression. How are you going to remember a phone number or a web address when you go zip. Plus they’re just ugly. Tom: Yeah, I can’t stand them. Claudia: No offense to anybody who has a big billboard business out there. Peter: So you’re a full-service firm that works with the smallest client – one person paper-hanging show like myself – to larger organizations, providing them marketing assistance. Claudia: Right, and and many of our clients are in multiple locations so they may not have just one business. We support them in different ways based on what that location needs. Peter: And we’re coming to you from their office in Dublin, Ohio, which is a suburb of Columbus, Ohio, so I was asking, because I didn’t know this, I asked about the client base and I asked if it was all here in central Ohio, and they said no. They have clients in… I’ll let you fill in the blanks. Claudia: Well, 99.9% of our business is on referral, so I’ll give you an example: the dentist that we’ve worked with for many years here, his best friend is in Raleigh, North Carolina. He referred us so we now work with them, and so that’s how it has evolved. Our long-term client was here moved to Virginia, somebody from their office moved out to start her own business and she came back to us. Claudia: So it’s it’s mostly referral-based. Peter: That’s outstanding, and I think you even have an international client, if you want to consider Canada as being international. Peter: I say international is any place that they have different money and you have to go through customs. Peter: That’s it. That’s international. You don’t have to fly over the pond. You may have to, from here, fly over the Great Lakes, but Canada’s international, which is great for a 30-year firm. Had you ever envisioned that you would have clients outside of the central Ohio area? Did you envision that you’d be able to grow this business as big as it’s gotten? Tom: You know, it has changed so much over the last 30 years. As technology has changed and marketing and advertising has changed – I don’t think I really had any solid predictions. We started out as an advertising agency, started out primarily doing automotive advertising. We did hundreds of television commercial, hundreds of radio spots – wrote and directed. Newspaper ads in newspapers, even back then. Newspaper ads here; newspaper ads in Washington, D.C.; newspaper ads in Naples, Florida. So within that auto industry we expanded a little bit outside of our neighborhood. Tom: I guess that was normal for us, and now with the internet well it’s normal for pretty much any business. Peter: Right, and I’m thinking: how much of the newspaper advertising, radio advertising, constitutes your total business, if anything? Peter: I was gonna say. Clauda: We have one client that uses magazine advertising very successfully. Claudia: Because of his audience. Other than that, if you came to me and said, can you put me in a print ad, I’d have to sit down and say, Yes, And I think you’re wrong. Claudia: and there is much more interest in that lately, and so we’ve been doing more of that for clients. Trying to position them for interviews, and to reach out to people that would influence their potential clients. Peter: Okay, and I also know that you do a lot of writing, and she’s an excellent person to correct any writing. Tom: I’ll vouch for that. Peter: I will vouch for that as well. So how much of your day is spent on writing, whether it’s writing articles, writing newsletters, writing stuff for your clients. Claudia: It’s probably anywhere between 30 and 50 percent of what I do, depending on the client, but web copy is really important, and while most clients want to write their own copy, they really don’t do it – and that’s okay, because it’s hard to put words down on paper. Claudia: It’s much easier if we just interview them and find out what the important things are, but we also do a lot of eNewsletters, blogging, social media, those kinds of things. Peter: And you’re sending out these newsletters to the database that that’s given to you. Is there SEO involved in the newsletter aspect of it? Claudia: There is in ways. Now most newsletters – all newsletters unless you’re sending them out via your own email, which is not recommended – also have links to web pages, so that’s important. What’s really most important though, for a user experience, is that it sounds like the company that I’m doing business with, or the person I’m doing business with; it appeals to what I’m interested in, or at least they offer enough information or enough variety that I can find something out of each newsletter to like; and that it is graphically appealing. Claudia: So I’ll give you an example. We just put out a letter for our client that was delivered this morning, and they have a kind of dry business. It goes to medical professionals, but it’s only about vaccines. Claudia: So you don’t get to play around with that content a lot because it’s based on being accurate. I mean, it’s pretty serious. Claudia: So how do you make that more interesting? Well it’s the division of and the presentation of headlines, logos from the vaccine and the pharmaceutical vendors, things that we can change about the look of that content without changing the content, so that it still captures somebody’s interest and they’ll read it. Peter: So you’re taking something that’s extremely dry, and accurate, and putting it in a way that somebody would want to read it. Peter: You work with accounts? Claudia [laughs] Um, we work with you. Peter: No, I’m an accidental account, which made me think of – especially as we’re coming up to tax season – I know a few firms here and in the central Ohio area that, as you’re saying this, I subconsciously have been doing this. I get their newsletters and I just kind of shake my head. It’s not visually appealing, and it’s just – no offense – but I’m thinking very linear thought that I’m getting content out, but it’s something about not opening it or driving somebody to open it, and I think that’s a really good point and I know I have an audience of CPAs and accountants, and I would just challenge you to take a look at your newsletter. If you’re not getting mine, login to my webpage. Also I am going to put in the show notes a newsletter that they produce, and actually this newsletter was the one that they featured the website in, and to give you an idea of… maybe you guys need to hire Trusty & Company to spice up the newsletter, because we’re all getting lots of newsletters. So let me ask you this question: you send a newsletter out, you have a database of a thousand, what’s a good average opening rate? Claudia: It varies by industry and so there are statistics out there that are available that say, you know, if you’re not for-profit this is where you should go, if you’re a retailer this is where you should go. Most of the ones that we actually send out for our clients come in somewhere between 25 and 40 percent opening rates. Claudia: It depends on their business and it also depends on whether or not they have any specific call-to-action. Those subject lines are really important for creating interest too, so that somebody will open them, but what we try to do is work with the client to say here’s the content that they click through, and they really liked this content. This content nobody cared about. I know you care about it, but your audience didn’t care about it. So we can replicate the good stuff and eliminate the bad stuff. Peter: But that takes we down this path: there’s a difference between the open rate and the click right, so what’s a good click rate? Claudia: Click rates really are much lower than that. If you’re in the teens you’ve got a pretty good click rate in general, unless it’s something so specific like, get a free… something. Those click rates go up much higher, but if you’re offering three or four articles and there’s a click-through opportunity to go to a blog post, they’re going to be pretty small. Claudia: If you get 10 to 15 that’s not so bad. It again depends on the size of your list. So if you’re sending to 2,000 people and 10 percent of them click through that’s huge. Claudia: 100 people? That’s fabulous. If you’re sending to 50 people and two percent click-through, still not so bad. Peter: Right, okay. 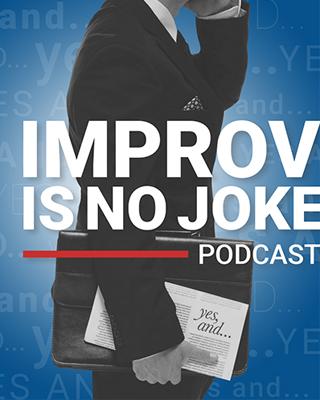 So take a look, for those who listen to this podcast and you have a newsletter. Look at the analytics behind it: look at your open rate, look at your click rate and see how you doing how you doing on that newsletter, because obviously that’s one way of many ways to keep in front of your potential clients, the current clients, and make sure that you stay in front of them. Claudia: The other thing that we look at is unsubscribes. Claudia: You’re always going to get an unsubscribe. I mean I unsubscribe to things on a regular basis too. Peter: I need to check my database to make sure that she hasn’t unsubscribed from me..
Claudia: Never you, Pete. Never. Claudia: I mean we all do it. For for a while you’re interested in XYZ because you’ve got kids in high school. Kids get out of high school and you don’t care about it anymore. Claudia: So we all unsubscribe, but if your rate jumps – if it spikes for any reason – that might be that the content isn’t really all that, you know, acceptable to the audience. And you can easily do surveys on that too, and you do the survey of your audience and say, what did you like and what didn’t you like? Here’s two questions, answer them please. Peter: Okay, that’s good information to know. I never thought about that, but yeah, and I know that there are many ways of gathering names to put in our database, and you always want to try to make those names as clean as possible. I use MailChimp, and I know that if I put in a bunch of names into that aren’t clean, and I start getting a lot of unsubscribes, they can pretty much shut me down. Peter: An island of misfits. Claudia: Yeah. A good list is far better than a mediocre list, so just grabbing names, just soliciting, that’s not good. Peter: Like here, I’m going to pass around a bowl, throw your business card and I’m going to do a raffle for a book. I pull out a couple names, but then you take a whole list of business cards. So I see this a lot of conferences. Vendors have their fishbowl there and people are coming by picking up chachka and throwing their names in there. Well that goes to a database and that might not be what they intended to give the business card for. Claudia: Right, what we’ve suggested before to clients – and we’ve had a client recently go to a conference and they wanted to do just that – but they were giving something away. Claudia: So what I suggested is we take all of those names in the fishbowl and we send them, just those names, an email announcing the winners with a button to subscribe. Peter: To opt-in. That’s a great idea. Claudia: So it it gave that person control over whether or not they would be solicited in any way. Peter: And InDesign and stuff, but how can somebody from my audience – obviously they can go in Google Trusty & Company – but how can they contact you guys. What’s the best way to reach you guys? The easiest way for people to contact us is to just go to trustyandcompany.com. Don’t do as we do. Get a shorter name. Claudia: Our name is way too long, but we’ve had it for way too long. At trustyandcompany.com you will find all of our contact information. Claudia: Or you can get ahold of me at Claudia@trustyandcompany.com. Peter: Great. Tom, Claudia, thank you so very much for taking time. Peter: I told you we’d have a few laughs doing this. Peter: Alright guys, thank you very much hope you enjoy the upcoming episode.